Storage systems must provide reliable and convenient data access to all authorized users while simultaneously preventing threats coming from outside or even inside the enterprise. Security threats come in many forms, from unauthorized access to data, data tampering, denial of service, and obtaining privileged access to systems. According to the Storage Network Industry Association (SNIA), data security in the context of storage systems is responsible for safeguarding the data against theft, prevention of unauthorized disclosure of data, prevention of data tampering, and accidental corruption. This process ensures accountability, authenticity, business continuity, and regulatory compliance. IBM® Spectrum Scale is a software-defined storage system for high performance, large-scale workloads on-premises or in the cloud. 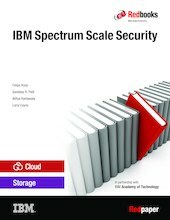 IBM Spectrum™ Scale addresses all four aspects of security by securing data at rest (protecting data at rest with snapshots, and backups and immutability features) and securing data in flight (providing secure management of data, and secure access to data by using authentication and authorization across multiple supported access protocols). These protocols include POSIX, NFS, SMB, Hadoop, and Object (REST). For automated data management, it is equipped with powerful information lifecycle management (ILM) tools that can help administer unstructured data by providing the correct security for the correct data. Unless stated otherwise, the functions that are mentioned in this paper are available in IBM Spectrum Scale V4.2.1 or later releases.